One day I'll post about our birthday party, or any of the other awesome things we've gone through since then. Really. One day. As if anyone still wants to read about it. But here's a short version of the last two weekends, using pictures, that I might or might not explain in detail one day. Probably not. 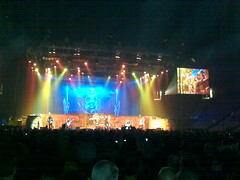 Last weekend we went to see Iron Maiden with dosboof and mandy_moon. All three of them have posted recaps. Awesome set. "Rime of the Ancient Mariner", unf unf. All the greats like "Revelations". Awesome time. The next afternoon we did Ravenchase with johnstevensaul and daeron. 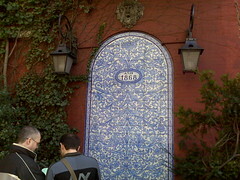 The four of us ran all around the Village figuring out clues and puzzles. We won, getting first place. johnstevensaul was totally our ringer. 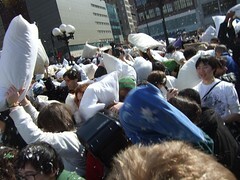 Two days ago we booked a trip to St. Maarten, then we went to Pillowfight NYC. We're still coughing up feathers. Yeah, just look at my pictures to see what I'm doing.